In March 2012, I participated in a study tour to the island of Bohol, near the unique Danajon double barrier reef ecosystem – the only one of its kind in the Philippines and one of only three in the Indian and Pacific Oceans. Nowhere is the connection between population dynamics and biodiversity more evident than in the Philippines, one of the most densely-populated countries on the planet, with more than 300 people per square kilometer. Nearly every major species of fish in the region shows signs of overfishing, according to the World Bank. Sponsored by the USAID-supported BALANCED Project, the study tour was organized by our partner, PATH Foundation Philippines, Inc. (PFPI), to show the benefits of health organizations working hand-in-hand with conservation groups in areas vulnerable to environmental destruction. Together with mayors and city administrators from around the Verde Island Passage, another strategic marine region of the Philippines, I saw firsthand how local men and women are struggling to improve their families’ quality of life. Remote communities often lack access to and knowledge about basic medical services, including reproductive health information on how to increase the years between births to ensure healthier mothers, children, and families. In areas like the Philippines, where people are heavily reliant on their natural resources for both sustenance and their livelihoods, beyond the health benefits, access to reproductive health services can also contribute to protecting local biodiversity by slowing growth rates to more sustainable levels. PFPI is working with municipal, executive, and legislative officials – particularly health, agriculture, and environment officials – and local community associations to deliver an integrated package of population, health, and environment (PHE) interventions. PFPI helps setup community-based programs composed of adult peer educators, who promote the links between smaller family size and better health; volunteers who work with fishing families to reduce destructive environmental practices and promote alternative livelihoods; and distributors who serve as outlets for PHE information and family planning and reproductive health commodities. Youth peer educators also work to deliver integrated messages to young people, encouraging planned families and small business development in order to break the existing cycle of poverty. Taken together, these synergistic interventions help men and women increase their abilities to better manage their environment and reduce pressures on already-fragile marine resources. Our study tour to Bohol included visiting several PFPI sites in communities in the northern provinces of Ubay and Bien Unido, some of the poorest areas on the island. In parts of Ubay, according to a provincial official, the poverty rate is an alarming 75 percent. But the people here are clearly motivated and articulate a bold vision of improving their children’s future in terms of health, education, livelihoods, and food security. During one visit, we heard from a young man who ferries passengers on his motorcycle across town. He spoke passionately of how, as he drives people around, he also talks to them about the benefits and options for limiting family size and promoting a healthy environment. On our visit to a distant island surrounded by a marine protected area abutting the Danajon bank, we listened to women who talk to their neighbors about the need to improve family health, protect the environment from destructive human activities, and also provide family planning commodities for a small fee. Along the way, we also met an elderly man whose arm had been lost to dynamite fishing years ago. The municipal coastal resources manager explained that although the destructive practices had been outlawed years ago, the need for food often trumps health and safety concerns. 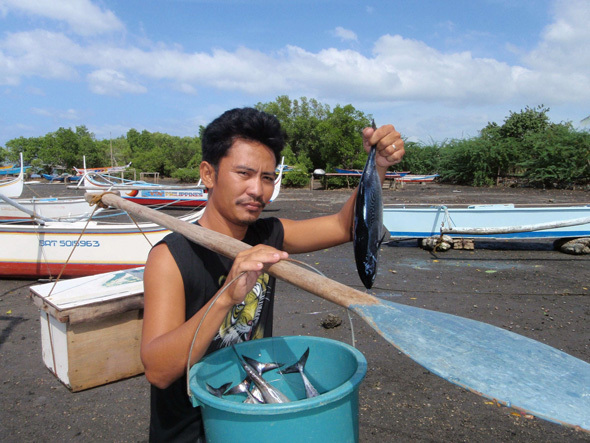 As part of the BALANCED Philippines Project, PFPI and community partners are working with the fishermen to respect the protected area’s boundaries, implement improved fishing practices, and develop alternative livelihoods. By the end of the study tour, the mayors and local officials from the Verde Island Passage clearly understood and were convinced of the need to better integrate and link health and conservation efforts to reduce pressure on coastal resources. They are already implementing their “action plans” with support from Conservation International Philippines and PFPI, through the BALANCED Philippines Project, to integrate family planning and health activities into marine conservation and livelihoods efforts. These local actors are making a significant difference in the lives of their neighbors, friends, and families, by giving them the tools to manage their resources and bodies, building bridges across sectors, and confronting the main threats to biodiversity in this unique country. Despite the success of these and other integrated population, health, and environment programs, many conservation professionals shy away from addressing reproductive health issues, considering them too sensitive or outside of their organizations’ mission. But since 2000, approximately 400,000 people have joined the 1.1 billion already living in fragile ecosystems worldwide. Though the natural population growth rate in these areas has undergone a significant drop – from 1.6 percent in 2000 to 1.3 percent today – a significant unmet need for health services remains and growth will continue. The intersection of people and nature in these areas will therefore play a significant role in the success or failure of conservation efforts in the years to come. Integrated PHE programs are not only good for the environment, but they further development efforts by providing valuable health services and encouraging sustainable alternative livelihoods. Janet Edmond is the director of population and environment at Conservation International and the deputy director for outreach and advocacy for the BALANCED Project. Photo Credit: Fisherman showing his daily catch in the Verde Island Passage, used with permission courtesy of Giuseppe Di Carlo/Conservation International. Awesome blog! Janet did an excellent job of succinctly outlining the rationale and benefits of linking human reproductive health, marine conservation and livelihood improvements strategies and how such integration collectively enhances sustainable development. Her explanation of how integration works at the grassroots levels via cross-sectoral coordination and collaboration among local government units, NGOs, fisher groups and local communities are insightful, and the real life examples she provides from chats with community volunteers engaged in PHE promotion work in Bohol provide further evidence that integrated approaches provide a conducive environment for behavior change to take place.